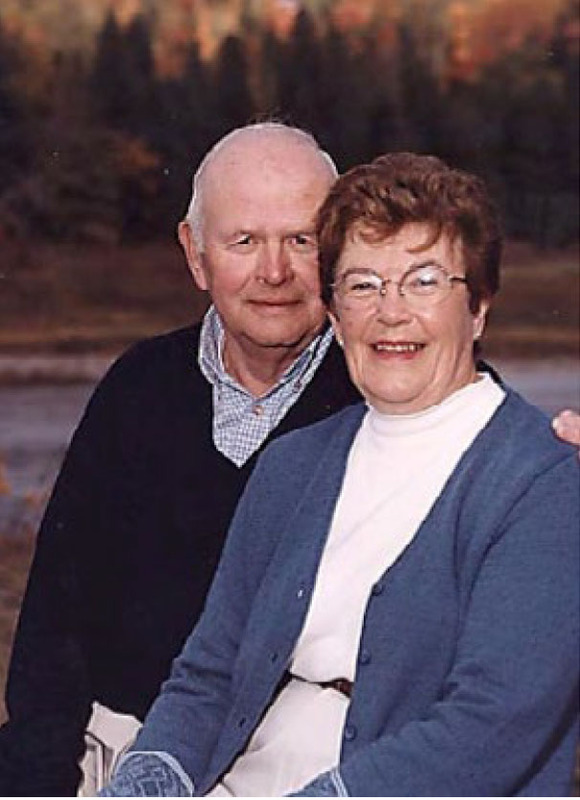 Walter and Joan Flewelling were lifelong residents and enthusiastic supporters of Greater Saint John. They were married fifty-six years and raised a family of four: Barbara, now deceased, Gordon, Richard and Stephen. They have ten grandchildren and nine great grandchildren. They shared with them their keen interest in community involvement, post-secondary education and healthcare. The couple were dedicated members of the Church of The Good Shepherd. Both served on vestry and as senior wardens. Joan was an active member of the Choir and Altar Guild, as well as the International Order of Kings Daughters and Sons. Their love of salmon fishing led to many happy times at Stoney Run. Curling at Thistle St. Andrews Curling Club and golfing at the Westfield Golf and Country Club kept the family busy and led to many hours of volunteer service. Joan was a Past Ladies President of the Westfield Golf and Country Club, and a member of the Probus Club. Walter’s success as a business leader took root early. As a young teenager, he was a self-starter, delivering papers and selling magazines. He ran his own business even before he graduated from Saint John Vocational School. The self-styled graduate of “the University of Hard Knocks” later pursued studies at the University of Western Ontario. During his food industry career he served in many capacities in senior management, becoming President in 1980 of The Willett Fruit Company Ltd.; later known as the Food Group, which included the Village Food stores. He brought a business perspective, leadership and active participation to many community organizations such as the Saint John Board of Trade, the Fundy Region Development Commission, the Economic Development Council, the Canadian Fruit and Vegetable Association and Enterprise Saint John. He brought dedicated and long service to The Carleton Union Lodge #8; was past Potentate of the Luxor Temple Shriners and a board member of the Montreal Children’s Hospital for eight years. The Maritime Golf Association, the Hampton Fishing Club, the Cliff Club, the Mayor’s Task Force, the Union Club, the Lancaster Golden Service Club, Cedar Hill Cemetery Board of Directors, the Advisory Committee of the Dean of UNB-Saint John’s Business Faculty and a UNBSJ Education Committee also benefited from his commitment . The Miramichi Salmon Association made him a life member. Ardent advocates for a Saint John University, the Flewellings were cognizant of its critical value to community development and need to achieve excellence. They admired the strength of local support for UNB Saint John and had a keen interest in the Masters of Business Administration (MBA) program. The Flewellings established a fund in 2008, which will award annual scholarships at the Saint John Campus of the University of New Brunswick for graduate students enrolled at UNBSJ in a MBA program. It is based on the successful student demonstrating a combination of academic excellence and involvement in extracurricular and community affairs. John. Their fund will award a scholarship to a student studying at UNBSJ in the MBA program.